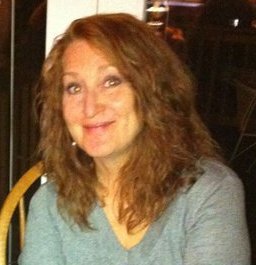 Spring Time Bedding and Comforters Add to Flipboard Magazine. Springtime is the perfect time for a fresh look for your bedroom. Start that process with new Springtime Bedding and Comforters! Spring Time Bedding and Comforters can help burn away the last bad memories of the winter blues. It;s time to rejoice! As winter turns to spring, I like to change the bedroom comforters to brightly colored bedding. It doesn’t have to be new, just something that I have stored away. Although, I am not opposed to the idea of adding to my collection of spring time bedding and comforters. I like change the bedrooms with the seasons. Springtime, or a little bit before, is the time to bring out the brightly colored comforters and spruce up the bedrooms to give them a fresh life again. The long dreary winter has a way of bringing us all down. This is my secret weapon to pull the entire family out of a bad mood. I don’t usually even bother to paint, unless it needs it. I just change the bedding to spring time bedding and comforters. I might change out some wall pictures to bring in a fresh breath of air. Ahhhhhhh……… Whatever it takes to give it a boost. 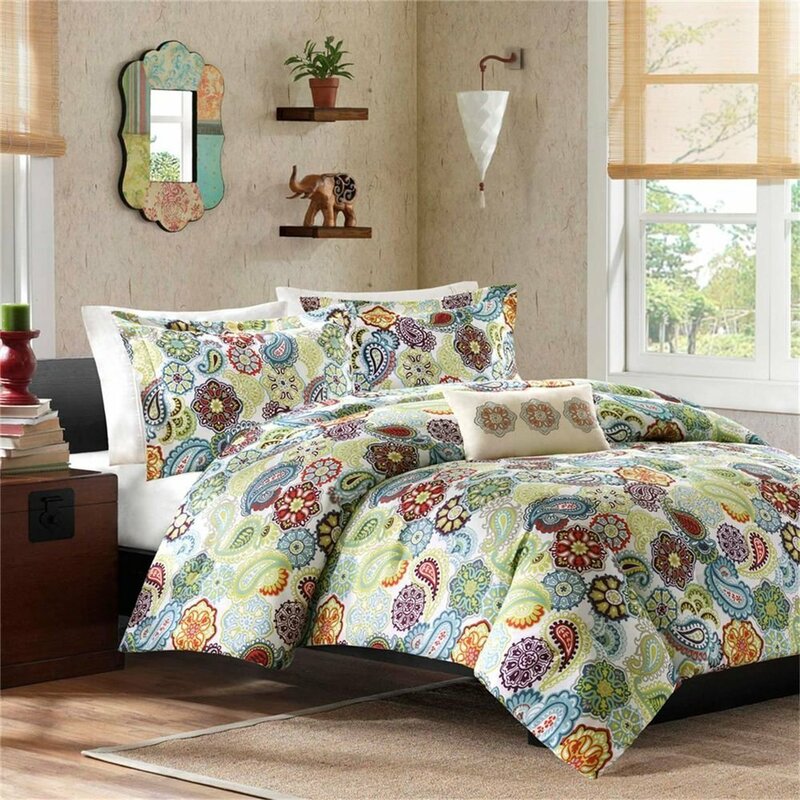 Featuring a 12-Piece comforter set with large colorful printed flowers in a queen size. It is made of 100-Percent polyester which makes it completely cold water machine washable. Everything I buy has to be machine washable. I love it! Great choice for bed covers for those who are allergic to feathers but long for the warmness. Style and coziness of a comforter, this comforter has all the right ingredients – Soft, Colorful, Comfy and AFFORDABLE. The Reversible Goose down Alternative Comforter Set Is made from micro fiber and is as soft as goose down. It is treated with anti-microbial finish to repel dust mites and is ideal for allergy sufferers. Did I mention it was reversible??? Well it is. You get twice the bang for your buck. Chloe is the perfect solution to an updated, modern print look. 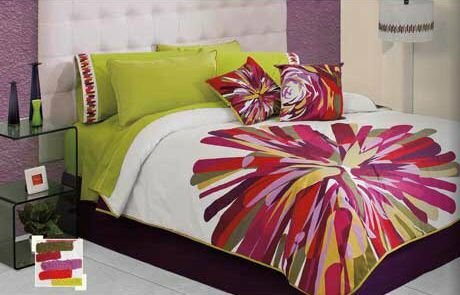 This Duvet set features an over scaled floral print design printed on 100% cotton fabric for a super soft hand feel. The decorative pillow feature embroidery and piecing details. The Tamil comforter set is a fresh look to the contemporary paisley pattern with an eclectic mix of colorful florals and medallions. Made from polyester microfiber, this comforter and matching sham are soft to the touch and machine washable for easy care. 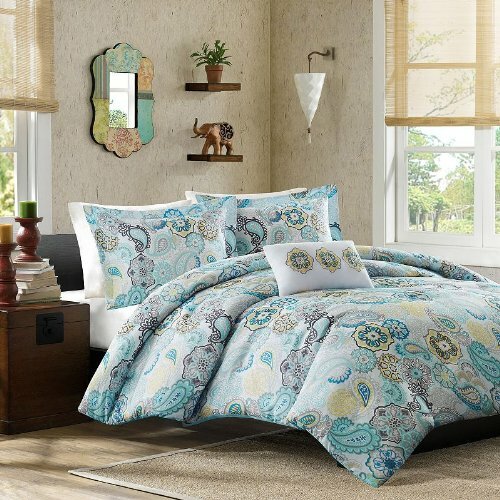 Completed with a white decorative pillow with corresponding medallion feature, this printed comforter set can update your room seconds with its beautiful color palette. Same set as above, but in a multi color pattern. This pattern really reminds me of the beautiful quilts my grandmother would make for us. 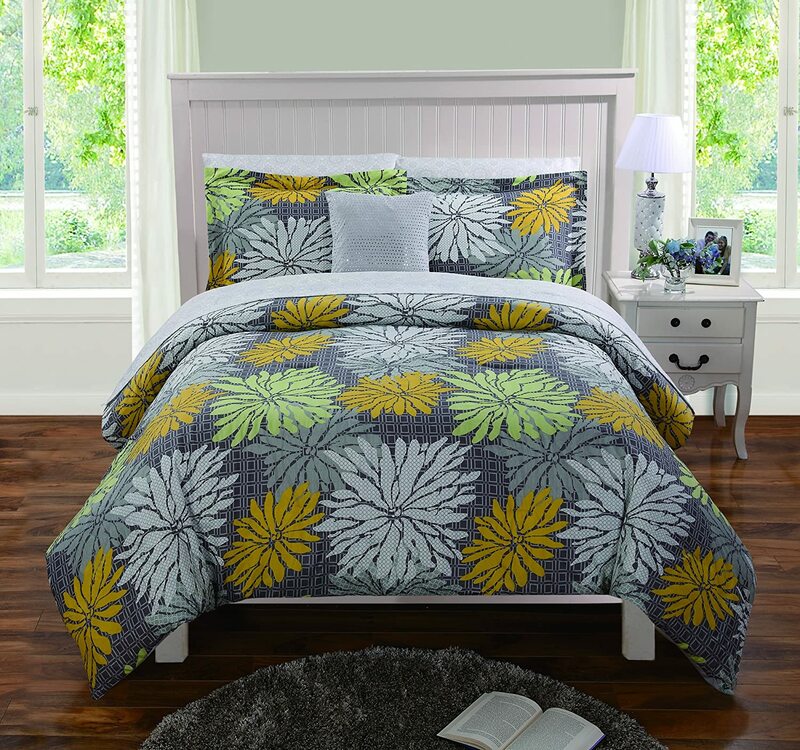 Update your bedroom or dorm room with this fashionable, nature-inspired Multi-Floral Bedding Set. The reversible comforter allows you to change the look of your room every time you make your bed. 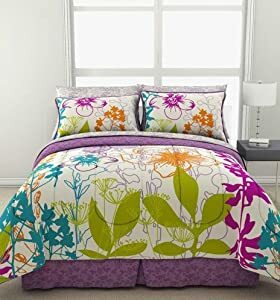 The bed set comforter features a colorful, floral design and reverses to a purple floral print. You’ll love reclining across this Multi-Floral Bedding Set while sleeping, reading or lounging in your room. This will bring the WOW factor to any girls bedroom. Set includes: 1 double sided comforter, 1 bedskirt, 1 flat sheet, 1 fitted sheet, 1 x toss pillow, 2 x window panels. Twin size also includes 1 sham and 1 pillowcase while full size includes 2 shams and 2 pillowcases. If you want to add freshness and brightness to your room, this is certainly the product for you. One of the most majestic and elegant line, known for its softness, elegance and color. The unique design gives the room a touch of freshness and tranquility. Also a perfect gift to give away on a special occasion. Twin size also includes 1 sham and 1 toss pillow. Full/Queen and King sizes also includes 2 shams and 2 toss pillows. You can also purchase this set along with with the coordinating sheet set and window panels.